A perfect example of American cold-war paranoia, everyone is a communist in some form? Only communists are capable of bad things, because the West hasn't been destabilising the world for decades? Neo-liberals aren't communists. Right I keep forgetting I'm an idiot who only listens to fake news. I'm proud of you Silly... it takes a real man (or woman) to admit something like that. Tell me why they wouldn't admit if it was attacked by muslims? Now we need to work on your critical thinking skills. Try this hint: for the same reasons they ignore or deflect on the numbers of rapes and assaults by Muslims on the local female populations. Didn't they admit it with every other Islamic terrorist attack in Europe? Brussels, Nice, Berlin, Barcelona, Manchester, London Bridge? Why would they begin a program of not reporting that now? They try hard to deflect, but those were too public and they couldn't just ignore them or lie about it. But if there is plausible denailbility? Absolutely. Why? Ok, I'll go ahead and say it. Because they're terrified of being labeled 'islamaphobic'. I haven't read much in this thread, so forgive me if this point has been made. It seems to me this might be the perfect scenario where one (or group) would utilize time travel capabilities to quench the fire before it was damaging. If ever there might be a reason to delve into time change, preserving this site would be right up there in my opinion. So can we assume there is no such ability? Or is it only used by the nefarious? Or perhaps this will become a Mandela effect...'I could've sworn I saw Norte Dame burn'. 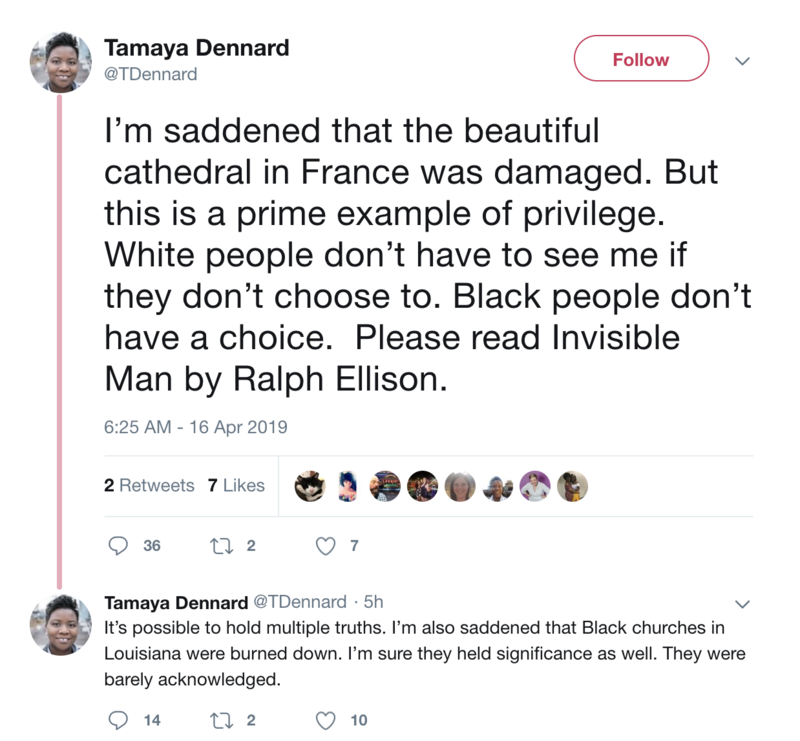 Meanwhile...Cincinnati Councilwoman Tamaya Dennard is making this about race. Talk about being embarrassed to have her be a community representative. Forgive my skepticism but there are some bizarre things going on right now. 3. Shep Smith of Fox news had a French elected official on for an interview and when he attempted to mention that several churches in france had been vandalized/arson recently he was IMMEDIATELY cut off...in the middle of stating facts. Apparently the same thing happened on another network. 4. the media seems dead set on MAKING sure this is not terror related, before ANY facts are in and regardless if it is or not. I think the French government and French investigators are all saying that it was an accident as well. But I have heard no detailed explanation as to why they think that way.